Challenging and thoroughly addictive! 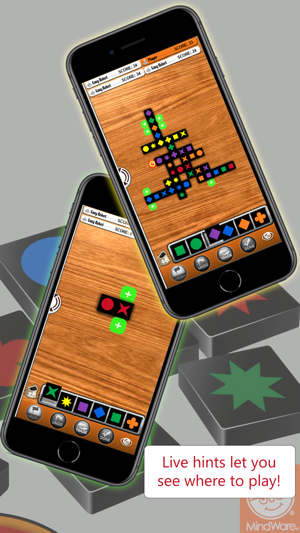 Now you can play the original award winning board game Qwirkle on your iPad and iPhone! 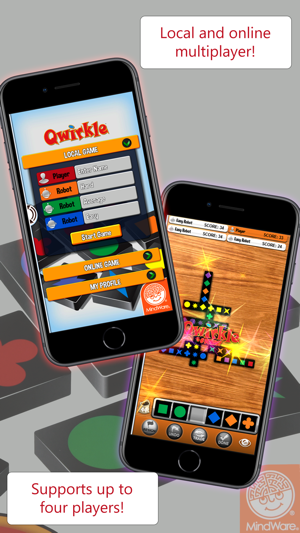 Qwirkle is MindWare's best-selling board game, with over two million copies sold worldwide. Through the years, Qwirkle has received numerous awards including Mensa, Parents' Choice, Major Fun and the Spiel des Jahres, Germany's coveted game of the year award. - Solo, Online, and Pass and Play modes all support up to 4 players. - 4 levels of difficulty, from easy to expert. 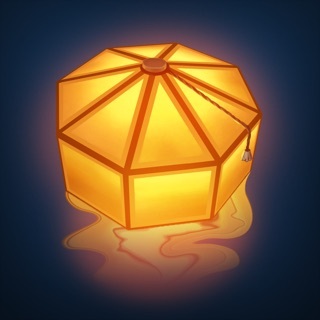 - Includes Achievements and Leaderboards through Game Center. - Customize your experience - choose your favorite background to play on. 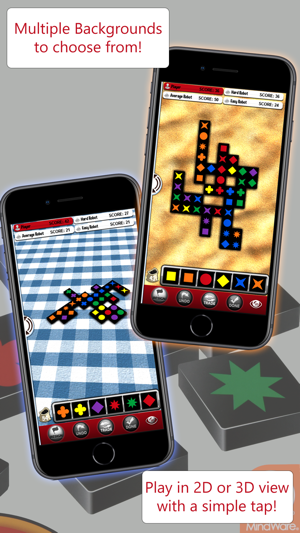 - Play with classic Qwirkle colors or personalize your tiles with custom colors. 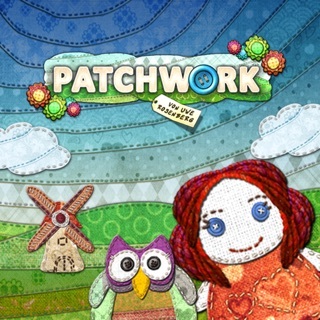 - Exciting animations and playful music enhance the Qwirkle experience! - Tutorial and Help sections get you playing fast and easy! - Play solo against 4 levels of robot, from easy to expert. 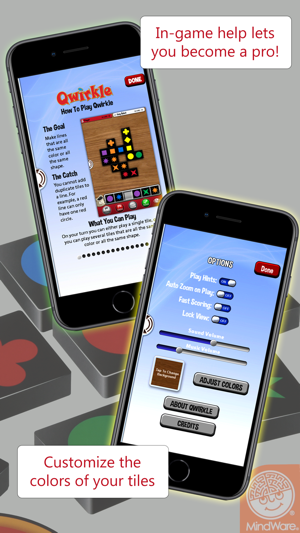 - For family game night, use Pass and Play mode to play together on a single device. - Challenge your friends to play online through Game Center. - Find new online opponents through auto-match in Game Center. 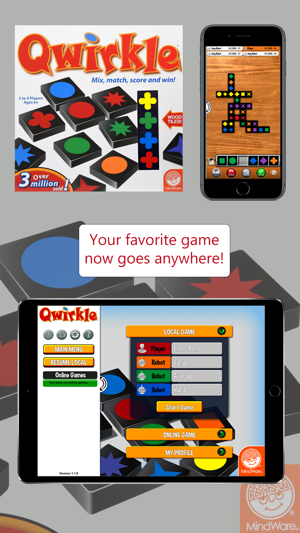 Want to share your thoughts on the digital version of Qwirkle directly with the developers? Email us at mindware@mindware.com with your comments! We'd love to have your input about what you like and ideas for improvements. We look forward to your feedback! - Added support for iOS 10 and above. - You can now play Qwirkle on your iPhone X. - Adjusted the Average AI based on player feedback. - Numerous bug fixes, tweaks and improvements. *Optimal gameplay is achieved using devices with iOS 10.3 or higher. This electronic version of the table game is brilliantly done. My family played the table version constantly when we all lived near one another. Now that we're apart physically, we can still play Qwirkle! Actually, to tell the truth, we play more than before because with this iteration there is no set up or clean up, no need to clean off a table or other large surface area, and players don't even need to all be free at the same time! So, why only four stars? My only problem with this great app is that the notifications system doesn't always work. For example, I do usually get an initial notification that it's my turn, but there's no number on the app itself indicating how many games I have turns in. This means that after I get the original notification and ignore it because I'm busy, there's no number reminder to let me see that it's my turn like so many other multiplayer apps do. This may seem like no big deal, but I play several asynchronous games with my friends and family in my scarce spare time, and without those numbers working correctly, I resort to loading the game to see if it's my turn or not. Again, this is only a very small annoyance and should not prevent anyone from purchasing and enjoy this excellent adaptation of a fabulous family game. We love to play the board game, and the app seemed like a great move. It is frustrating, however, when it's clear that you've been set up to lose the game. I do not mind losing, I just want competitive play. If I set up five tiles in a row, it's pretty much guaranteed every time that the robot will get Qwirkle. It seems that after winning so many games, you're forced, no matter what, to lose so many games. So it makes me question whether or not I even won originally based on my ability or because the computer decided it was time for me to win. I've played more games than I care to admit, and the pattern is very clear once you've played for long enough. That said, it has been great practice for when we play as a family. I do really enjoy this game. This is the same great game that you can buy in a box. At first it might appear simple but there a good defensive and piece management strategies that can be deployed. Playing as an app though I would expect a good interface and integration with Game Center. Unfortunately these have a way to go. As an example for the interface, you can shuffle the position of the pieces in your hand to help rank by importance for example. But if you're waiting for a player and leave to browse Facebook when you come back the pieces are in the original order, forcing you to reconstruct your whole thought process. As for Game Center, in it horribly put of sync and sometimes I must push ten buttons or so when it alerts me that it's my move to finally get to the game.